The advent of Solid-Core electrode for joining took place about 100 years ago. Then, came Solid-Core electrode for Hardfacing where high alloy contents in the weld-metal were the primary considerations to impart wear-resistant surfaces on base metal. Since high alloying elements need to be transferred across the arc to the weld-metal, thick flux coatings for such Hardfacing Solid-Core Electrodes became the necessity. 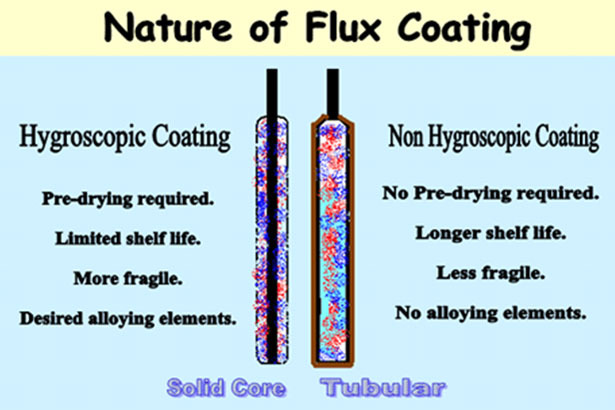 Effective result of such thick flux coating having high-alloy contents leads to the following short-comings. It is universally accepted fact that THF electrodes give greater wear resistance & twice the VALUE FOR MONEY of Solid-Core Hardfacing Electrodes. Since a combination of wear factors is responsible for wear of components, Cuarepoti Electrodes has developed THF Electrodes based on the Primary wear factor and then the Secondary wear factor(s). This product is so used in tillage tools, screw drivers for cereal and many other uses. High content of chromium carbides. These products have a good market at mining parts, sugar mills, buckets and so. These tubular rods are usable with OAW, SMAW, TIG. GF; Fine mesh size with high wear resistance. GG; Coarse mesh size improve cutting efficiency. 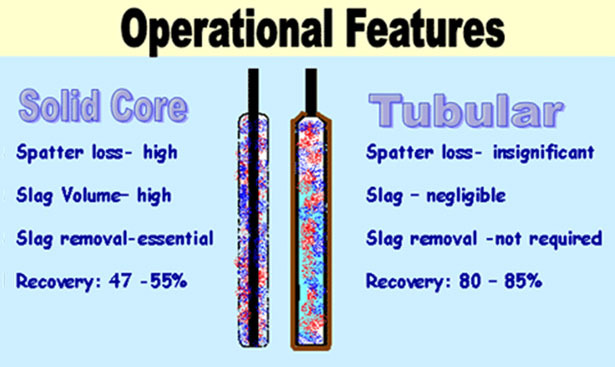 The last one is so used with OAW for drumbars and rotobars of harvesting machines for improving performance without damaging soybeans and other cereals. The premise is that the harder the material, the greater the wear resistance. While this is technically correct, applying this principal across the board to achieve higher wear-life of components may lead to some catastrophic results. For example, Martensitic Steel and Chrome Carbide Iron with the same 600 BHN hardness will differ in wear resistance properties. The later will impart much better wear-life. While testing hardness in conventional hardness testing machine the size of the impression of the indentor is quite a bit larger than any of the individual grains or hard particles of the weld-metal. Essentially this hardness test is measuring the average hardness of many grains / particles. It's possible to think of this test as a Macro Hardness test. A Micro Hardness test on the other hand measures the individual hardness of each grain or particle. It is apparent that choosing materials to resist wear based on hardness alone, and in particular, Macro Hardness values, can be very risky. It is essential to understand the microstructure of weld-metal to establish wear-resistance characteristics. Identify the composition of base material. (Austenitic manganese steel, carbon steel, wear resistant steel, alloy steel etc). Recognize and understand the wear problem (abrasion, erosion, impact, heat, friction, corrosion, vibration, compression etc,) singly or combination decides the type of alloy to be used. High deposit hardness does not always mean the best overall wear resistance. While selecting a Hardfacing alloy for maximum wear resistance considerations of the total alloysâ€™ presence and also the presence of carbides are to be made. 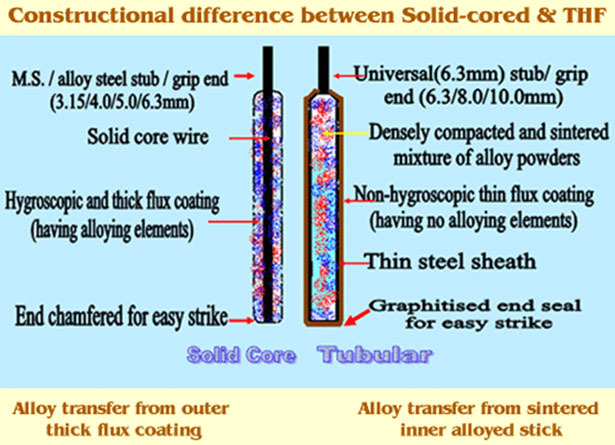 Tubular Electrodes always give more & uniform alloying elements in weld-deposit vis-Ã -vis Solid-Core Electrodes. Never make the assumption that higher priced alloys always provide the best wear. In case of high build-up because of excessive wear the restoration of original base metal is needed prior to Hardfacing. In such cases select a build up alloy that is compatible with the base metal composition. The quantity and hardness of the carbides in an alloy generally determine the deposit hardness and resulting wear resistance. Presence of Carbides/ Complex Carbides in the weld-metal is the best indicator of wear resistance. 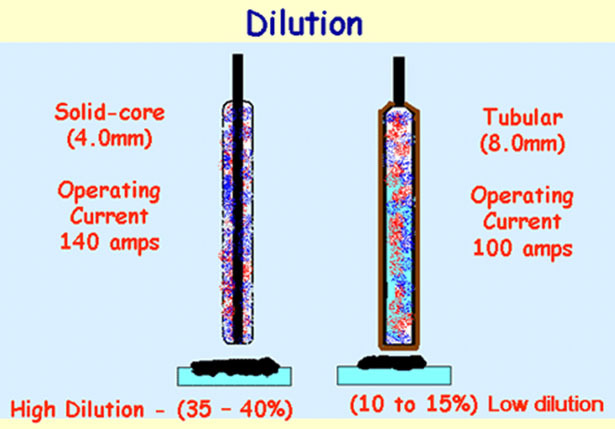 Tubular electrodes give richer Carbides/ Complex Carbides in deposit. Never choose a Hardfacing alloy based on its price alone. 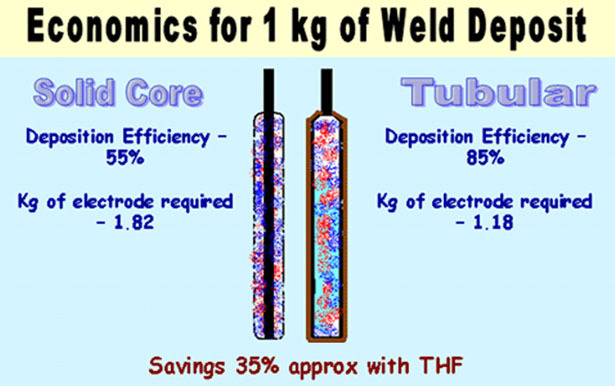 Over-all cost savings involving total quantity of electrodes, rate of deposition and productive welding time should be the primary consideration. Do not assume that two alloys with the same hardness rating will wear-out at the same rate. Metallurgical structure giving rise to such equivalent hardness should be the primary considerations.